Cocos Island, 1997: World Heritage Site since 1997. Cocos Island is one of the most privileged natural sites worldwide due to its size, isolation, and conservation status. Due to its great biological diversity and the large number of endemic species, it can be classified as a natural laboratory for research on the evolution of species. 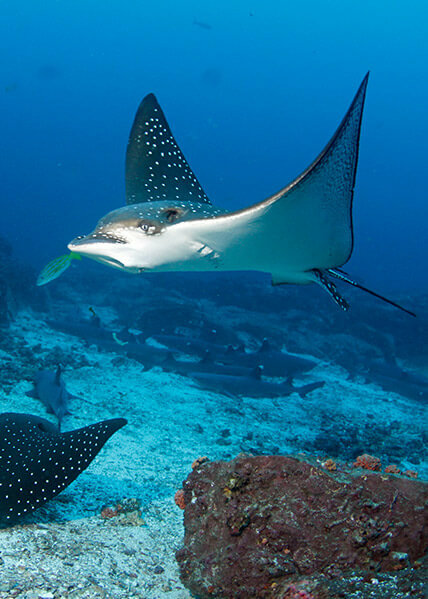 In 1978, the Government of Costa Rica created Cocos Island National Park, which was later declared the nucleus of the Cocos Marine Conservation Area. In 1997, the United Nations Educational, Scientific and Cultural Organization (UNESCO) declared it a Natural World Heritage Site. In 1998, Cocos Island National Park was declared a Wetland of International Importance under the International Ramsar Convention of 1991. On October 11, 2002, the Government of Costa Rica declared Cocos Island as an Architectural Historical Heritage of Costa Rica. This declaration is due to the high historical and cultural value that Cocos Island has for the people of Costa Rica and the world, forged from the eighteenth century through the visit and permanence of human groups coming from different places and with different purposes. Costa Rica (Cocos Island National Park), Panama, and Colombia are part of the CMAR Tropical Eastern Pacific Marine Corridor. The condition of Cocos Island as World Heritage Center and as National Park obliges the State to protect all its existing values: natural, historical, and cultural. These declarations prohibit the demolition and partial or total remodeling of the buildings and the alteration of the elements with historical and cultural value that are in it, without prior authorization of the Center for Research and Conservation of Cultural Heritage of the Ministry of Culture and Youth. The Government of Costa Rica declared Cocos Island as an Architectural Historical Heritage of Costa Rica due to the high historical and cultural value that it has for the Costa Rican population and for the world, forged since the 18th century. The inscriptions on the rocks of Chatham and Wafer Bays, as well as the other cultural vestiges that can be found on the island, witness as to the history of the place, giving it an exceptional value that deserves to be protected and conserved to be enjoyed by the present and future generations.